Written by one of the foremost experts in the area, the book challenges current thought and re-assesses the rules of economic integration within an environmental framework. In so doing, it bridges the gap between environmental and trade law and provides a systematic, robust, and practically workable analytical framework of the conflicts opposing rapidly evolving environmental and climate change measures and internal market as well as competition rules. The book is divided into three parts, beginning with a systematic and in-depth analysis of the key Treaty provisions regarding environmental protection, as well as an overview of secondary environmental law. Part two addresses the compatibility of EU and national environmental protection measures with the provisions of the TFEU on the free movement of goods and services, and the freedom of establishment. Part three examines the compatibility of environmental protection measures with treaty provisions on the freedom of competition and State aids. The book also includes discussion of all major cases handed down by the Court of Justice, highlighting the real impact of the conflicts. EU Environmental Law and the Internal Market is a key volume for the study of the EU's environmental policies. All legal scholars dealing with environmental governance, the EU or international institutions are encouraged to add this impressive work to their bookshelves. 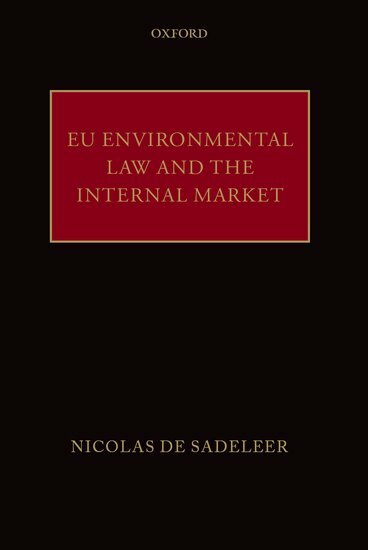 Environmental Law and the Internal Market is another remarkable work of Nicolas Sadeleer. This very pragmatic book offers answers to very specific questions... [and] it comes as no surprise that the author is deemed to be one of the foremost experts of environmental law at world level. Nicolas de Sadeleer is without doubt one of the most productive and thorough of all legal scholars dealing with EU environmental law...in broad brushstrokes, he informs us about the encounter between the two perspectives of EU law; business and free trade on the one hand, and the environment and climate change on the other...he manages to merge the different worlds of business and the environment, which makes the analysis fruitful for readers from all sectors of society, not least practitioners. This is certainly not a book reserved for just one category of reader... an excellent book to place in the hands of law students, civil servants, business lawyers and administrators interested in EU law in connection with free trade, competition and the environment. 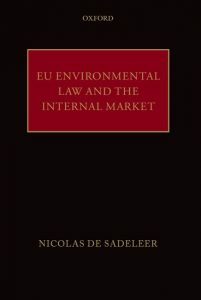 De Sadeleer manages to provide a full and encyclopaedic overview of all aspects of EU internal market and competition law through an environmental lens... He addresses a broad range of issues in a clear and accessible way, helped by the inclusion of instructive tables and to-the-point summaries of the main aspects discussed throughout the book. These are helpful tools for non-EU lawyers and non-academics to navigate and gain a comprehensive overview of EU environmental law and associated disciplines. As Judge Rosas has pointed out in his foreword, one of the merits of this volume is that it is aimed both at academics and at practitioners. Another is that, rather than treating EU environmental law in isolation, it concentrates on the interaction between that area of law and the internal market; this approach enables the reader to gain a far better understanding of how EU environmental law works in practice. In short, this impressive work is a must for anyone interested in EU environmental law. This is a thought-provoking book in which Nicolas de Sadeleer succeeds in setting out and analysing the relevant law on the environment and the internal market in a clear and accessible manner, while at the same time addressing difficult issues relating to conflict in implementation. This scholarly and comprehensive work not only identifies and addresses these issues at the heart of the EU, but also proposes solutions both legal and practical.